"I wrote my first book because I wanted to read it." The BBC did a seven part program about Vivaldi and the Pieta. Check it out! I've always wondered what women were doing in the past, since what's been passed down is largely the accomplishments of men. Learning that one of the great orchestras of seventeenth and eighteenth century Europe was all-female—and largely foundlings and orphans to boot—was a true thrill for me. 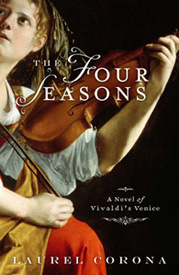 As a professor of Humanities, a woman, and a writer, I found the story of composer Antonio Vivaldi's involvement with the Pieta endlessly fascinating, and I wrote The Four Seasons to share it with you.